Q: Why is my vinaigrette separated into 3 layers? A: We chose a three-phase fill instead of sneaking in any strange artificial binders to get a perfect emulsification. It requires a little shaking on your part, but we think it's worth it. Q: From where do you source your honey? A: We get our organic honey from a Michigan-based company that is the worldwide leader in honey processing. Every ounce of honey they produce has been sourced, tested, processed and packaged based on the highest standards in the industry and they also retain the pollen in honey. Q: Does the Lemon Juice concentrate contain any added sugars? A: The lemon juice concentrate consists of 100% organic lemon. Q: Is the apple cider vinegar filtered? A: No, the Apple Cider Vinegar is not filtered. Q: What is the shelf life of your Honey Mustard Vinaigrette? A: 9 months unopened. Please refrigerate after opening and use within 60 days for maximum freshness. We dare you to try and keep it that long. 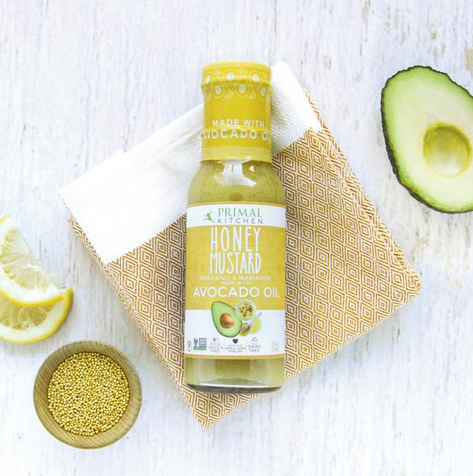 Q: Does your Honey Mustard Vinaigrette contain garlic, onion, or nightshades? A: No, it does not contain any nightshades. It does Not contain garlic or onion either. The FDA legally requires those to be declared and they cannot be listed as "spices." Q: What are the "organic spices" in the honey mustard dressing? A: The Organic spices do contain black pepper as well as organic cinnamon and organic ginger. Q: What is the organic vinegar derived from? A: It is actually derived from sugar cane, but no sugar remains in the end product. Most vinegar is derived from corn or grains, so the sugar cane derivative is a good thing, as it is grain and gluten free. Q: Is the apple cider vinegar in your dressings pasteurized? A: The Organic Apple Cider Vinegar is not pasteurized. The low pH of our dressings protects against pathogenic microorganisms, and they aren't subjected to heat in the processing because of the pH and nature of the ingredients. Q: What is the Fat profile?